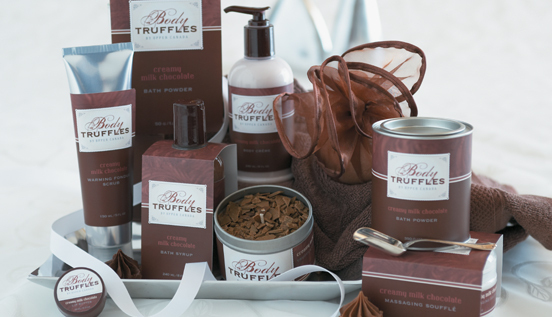 Tempt your senses with the bath and body care line made for the woman who is passionate about her chocolate! Body Truffles by Upper Canada is the ultimate line of rich and luxe bath and body products guaranteed to entice your senses and pamper your body and with the decadence of real cocoa and rich cream. Enhance your bath experience with our ultra decadent Bubble Bath Syrup - made with real cacao extract and rich milk proteins to soften skin while our Soothing Bath Powder enriches bath water with sea salts, cocoa seed butter and Vitamin E. And for those extra indulgent occasions, double your pleasure with our Molten Lava Bath Fizzie – a fragrant effervescent bath fizzie plus foaming bubble bath centre for two treats in one! Then, top your skin off with our Warming Fondue Scrub - enriched with sugar, shea butter and glycerin plus a unique heat activated extract that warms up on contact to cleanse and soften all in one! And for the finishing touch, drench your skin in luxuriously rich and velvety soft Body Crème – an intense blend of real cocoa butter, sweet almond oil and shea butter leaving skin silky soft to the touch. Go ahead and spoil yourself or a friend with Upper Canada's most pampering bath and body care line! Available in sinfully decadent chocolate fragrances, Body Truffles will leave you feeling and smelling sweet as can be in Creamy Milk Chocolate, Double Chocolate Raspberry and Belgian White Chocolate scents.